Are you fed up from those annoying pop up ads on your Android Smartphone? Do you want to get rid from annoying ads? If yes, then you've landed at the right place today. I can assure you that after a brief reading of this guide you won't come across those creepy advertisements on your Android again. 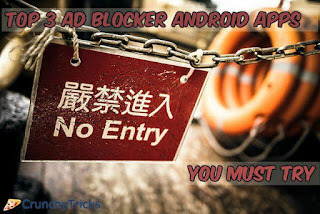 Today we're having a collection of top 3 best ad blocker apps for Android. We've reviewed them according to their popularity and customer satisfaction. There's one thing you must know. Do you have any idea why you're facing these ads while surfing on your Android browser? If not then allow me to clear your doubt. At present if a website or application is providing free stuff, content or services then in return they would show ads on their website. This help them to earn some decent amount of money and keep the website up. Those ads can be frustrating for you but it can be a living source too for the webmaster. But sometime webmaster are concerned only about money. They'll place advertisement in such a way that conversation rate becomes too high. They don't care whether you're satisfied with their free services or not. The main aim is only conversion of every landing person in some bucks. If you're fed up from those sticky ads on Android or not able to access any software due to them then keep on reading. Below we've covered ad remover apps for Android phone. Give them a try and let us know whether they are working for you or not. This app has been placed at first place in our list only because of its best results. You won't be able to find it on Play Store as they've banned it. But the developers have provided a direct apk link on their website. Simply navigate to their website and download it. Block Ads: - One can easily block pop-up, flash, banner, video, pop-unders and Facebook ads too. It's only because of the filter list(s) you're going to select. You can add it manually too. Disable Tracking: - Beware! some websites might be tracking your online presence and your browser history. Further this information is sold to several multinational companies. But don't worry if you're using Ad block plus then you can safely search overs the Internet. Disable Malware Domains: - Adblock Plus can be easily configured to block domains which are spreading viruses, malware and trojans. It'll automatically remove viruses on its own once installed. 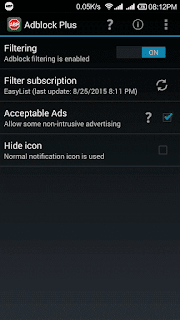 Allow Acceptable Ads: - This option allows ad block to show some non-intrusive ads. As these ads are not annoying and don't track any type of information. Remember before downloading adblock to your android device it must be enabled for unknown sources app installs. If it's not enabled then follow the below steps. Check the box and confirm it with OK button. Now simply open their website and install apk on your android device. Once installed, open the app and enable Filtering option. If you don't want to show any type of ad including non-intrusive then simply disable Acceptable Ads option. TrustGo Ad Detector scans and protects your phone from potential privacy violations and identity leaks through ads displayed by apps via the most commonly used advertising networks. Most of the advertising networks can easily collect information related to your device such as how you use your phone, websites you open often. This information is used by companies for targeted marketing campaigns. Pushing ads to your Android notification bar. Creating unauthorized shortcuts on your home screen. Modifying the default browser, homepage and bookmarks settings. Subscribing you to emails and text messages when an ad is clicked. Making phone calls and downloading malicious files when an ad is clicked. 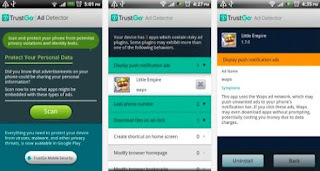 It's similar to TrustGo Ad Detector. This app detects all the malicious activity of apps installed on our device such as push notifications, Desktop icon spam ads, privacy issues. It also identifies adware and spyware and provides option to remove them. Currently AppBrain can detect over 70 unwanted aspects of apps. One can easily get rid of annoying ad notifications and desktop bookmarks. It help you to know which apps can access your message or contacts as it can cause a serious privacy and money issue to you. This app tells you which ad networks are embedded in apps, such as Admob, Millennial Media, ChartBoost, TapJoy and many smaller ones. Also indicates which ones may have push ads. Not only this it can detects whether apps have SDKs like Facebook, VKontakte, Twitter, and more. So this was all about how to block ads on android using ad blocker apps. These were the best and only available options. Let us know which one you like. If you're facing any issue or having any doubt then we've comment section below. Leave a comment there and we'll get back to you. "These were the best and only available options"
Not sure why you state this - surely you have heard of AdAway?